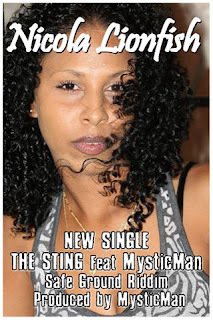 iDancehallReggae.com::Caribbean Lifestyle Media::: Bahamas: Nicola Drops "The Sting"
Bahamas: Nicola Drops "The Sting"
Caribbean Lifestyle Media recently caught up with Nicola Lionfish, we discussed the release of her new single "The Sting". The sting is an addition to Nicola's slew of other hits. Nicola who hails from the Bahamas, with roots in Germany is confident that this coming year is her year. This new tune features and was produced by Mystic Man. The name of the Riddim is called Safe Ground Riddim. Nicola sums up her perspective on writing, "I used to write poetry when I was younger, it probably come from there. When I write my songs, I have so much to say. You cannot put all of that in one song so I make statements. I sum it up in one statement, maybe in five words instead of ten words."